A man approaches another man in a parking lot, blasts him in the face with pepper spray, grabs his wallet and runs away. Six teenagers kick open an apartment door, spray a man with Mace before he can eyeball them, then make off with his color television. These two incidents illustrate a trend that is beginning to appear in police reports. The so-called “self-defense sprays” — pepper spray and tear gas — are not just for defense anymore. Like any weapon, incapacitating sprays can be turned against innocent citizens. The sprays can blind and render a person helpless — for a while. But unlike. many weapons, sprays are cheap, easy to obtain and legal to carry “for self-defense purposes,” even by minors. Since January 1994, the Arkansas Democrat-Gazette has reported at least 17 crimes involving the use of chemical sprays in Arkansas. There may have been others — police just don’t know. Crimes involving sprays have ranged from assaults to armed robbery. “People normally use guns,” he said. But police don’t keep statistics on how often the sprays have been used to commit crimes. In reporting crimes, most law enforcement agencies follow the FBI’s Uniform Crime Reporting guidelines, which groups weapons into three categories: firearm, cutting instrument and other weapons. The last category “could be anything — a brick, a table, a glove. Anything,” said Lynn Bulloch of the Arkansas Crime Information Center. There is no separate category for sprays. Steve Crafton, a Little Rock electronics store clerk, was working in March when he saw a man trying to steal a car stereo kit. When Crafton and several other employees cornered the man, he began firing pepper spray at them. He splashed one employeeacross the ear with pepper spray and ran. Crafton ran through a spray cloud while pursuing the thief. Even though Crafton didn’t sustain a direct hit, one eye slammed shut. He began to choke. The robber knew what he was doing — he had brought three cans of pepper spray, Crafton said. Ron Bullerwell, vice president of the Fraternal Order of Police Lodge 17 in Little Rock, laments the day that these sprays became legal. “Personally speaking, I believe they never should have put the stuff on the market except for law enforcement,’ Bullerwell said. The majority of Arkansas police officers feel the same, he believes. Though the FOP has not taken a position on the issue, Bullerwell would like to see mandatory licensing and registration of the sprays. Donald Cahill, legislative director for the 270,000-strong police organization, said that if the sprays become an abused product, the organization may advocate training or licensing. For the moment, however, Cahill is not aware of widespread criminal use of the sprays. The effects of a typical pepper, or “O.C. spray” don’t last long. The spray consists of an aerosol-propelled solution of oleoresin capsicum, a derivative of cayenne peppers, ranging in strength from 2 to 20 percent. The pepper solution forces the eyes to slam shut and inflames mucous membranes, making breathing difficult. In most cases the effects dissipatewithin a half hour or less. Tear gas, another commonly available spray comes in two forms, CN and CS. Both types cause temporary blindness by irritating the mucous membranes of the eyes. Tear gas does not always take effect as immediately as pepper spray. It occasionally causes blindness. In rare cases, tear gas can kill susceptible people. For these reasons, law enforcement has rejected tear gas sprays in favor of pepper sprays. 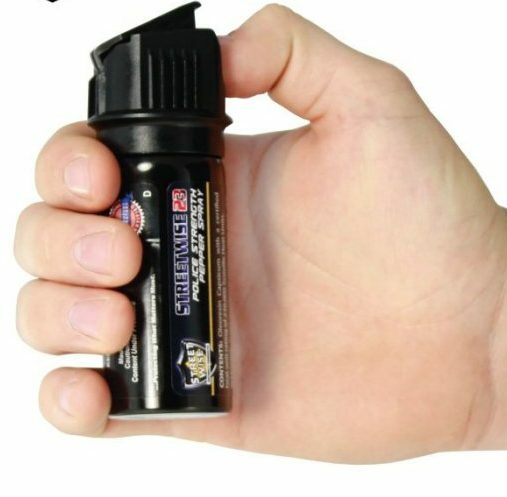 The Little Rock Police Department issues Punch II brand pepper sprayto its officers. With a 5-percent pepper solution, this spray is only one-fourth as strong as some other widely available sprays. But the man who trains officers in the use of the spray says that doesn’t matter. “I’ve been sprayed with 1-percent, I’ve been sprayed with 5-percent, and I’ve been sprayed with 2-percent, and the pain’s the same,” said Officer Rusty Wilson of the Little Rock Police Department’s training division. Wilson said police are trained to take the threat of being sprayed very seriously. If the officer can’t back away in time to avoid being sprayed, he can shoot to kill. A suspect could take an incapacitated officer’s gun. “If (the officer) doesn’t have the opportunity to retreat, then he is justified in using deadly force,” Watson said. Instructions imprinted on a canister of Mace-brand combination pepper-tear gas spray cautions: WARNING: The use of this substance or device for any purpose other than self-defense is a felony under the law. A spray attack in Arkansas might carry only a misdemeanor charge of third-degree battery, however. Most spray attacks simply incapacitate the victim temporarily. Under state law, the seriousness of the physical injury determines the seriousness of the charges. Thus, a spray attack can result in charges as light as third-degree battery, a Class A misdemeanor — the equivalent of making telephone calls threatening someone’s property. “If for some reason something caused a more permanent effect, we would look for more serious charges,’ said W.A. McCormick of the Pulaski County Prosecuting Attorney’s office. Fortunately for spraying victims, the effects usually do not last. Still, as Crafton can attest, getting a blast of pepper spray is not pleasant. “It’s not that great being Maced,” he grumbled. While unhappy that criminals like the one who robbed his store now carry pepper spray, Crafton prefers that they have nonlethal sprays, given the alternatives. “It’s bad, but if they didn’t have that, they could have had a gun,” he said.